Nevada Legal Guides is a publishing and internet development company dedicated to producing high-quality resources for attorneys and others. Nevada Legal Guides is owned by Steve Klearman, Esq. and Kevin Wang, PhD. Steve and Kevin also own and operate a stock media company for US lawfirms that can be found at www.AttorneyPoint.com. 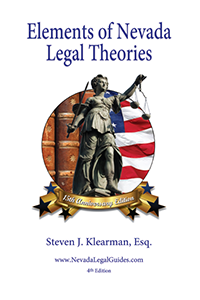 Nevada Legal Guides is owned by Steve Klearman, Esq. and Kevin Wang, PhD. All of our books can be purchased below. Back and better in its 15th Anniversary Fourth Edition, this concise guide provides the elements of Nevada's most frequently pleaded common law and statutory claims, together with supplemental information for each claim that covers facts, proof, remedies and damages. A recently added section adds applicable statutes of limitation where possible. Utilized and valued by attorneys and judges throughout Nevada. This is the one and only original guide to the elements of Nevada civil law, developed with a team of top legal researchers over 15 years. Anything else is just cheap imitation.